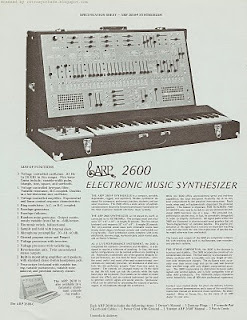 ARP 2600 reference sheet from approximately 1971. How far synthesizer manufacturers have come when it comes to reference sheets. And to prove this point, I've scanned this ARP 2600 reference sheet from approximately 1971 so you can compare it to the 1980 Moog sheets I've recently blogged about (Minimoog, Polymoog). Down right primitive. But it does have a lot to say. Lets start with the paper choice - a medium-light blue. Maybe they picked this colour because early 2600s were known as 'Blue Marvins', but even ARP must have realized this makes it harder to read and converted over most of their later reference material to the almost-universal standard of black text on a white background for good readability. And speaking of the text, you can tell ARP was having difficulty trying to decide whether this was a 'specification sheet' as they refer to it, or a marketing piece. To me, most of the tiny crowded text on the page is a sell-job to live performers and educators, sugar-coated as reference information. I'm not saying marketing material was non-existent in reference sheets, but usually the more flowery text was saved for 2- or 4-pagers like this two-page SRM CAT sheet. Lets face it, ARP just didn't have the room for all that text on one page. Especially with that honkin' big image. I do dig the two images of the 2600-P and 2600-C. 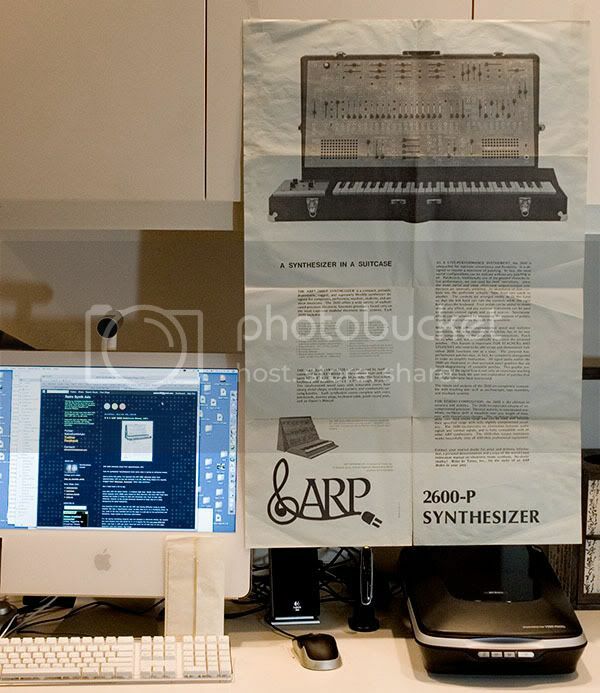 The fact ARP chose to use a larger 2600-P image tells me that ARP was really pushing the 'portable' version of this machine to musicians that were playing live gigs. The text on the sheet also leads off with the live performance aspect, then education, and finally studio composition. Although there isn't a date on this sheet, the photos of the 2600s also provide clues as to when this reference sheet was printed. If you look really really closely at the larger photo of the -P, it looks like the logo in the left speaker grille is the 'Tonus' logo. I'm not that familiar with 2600s, but my understanding is that early -Ps had the 'Tonus' logo like this one posted on the gearslutz board, and later V.3 and V.4 models had the more common "G-clef' ARP logo. Also, there is no power-indicator lamp on the front panel of this 2600-P, leading me to believe it is either a *very* early unit or a photo of a pre-production or prototype model. All the other -Ps I've seen have the lamp. The keyboard in the photo also looks to be the earlier 3604 model with the three controls for portamento, tuning, and scaling - here's a close-up image of the 3604 keyboard controls from a MATRIXSYNTH auction post. The smaller 2600-C photo in the bottom left hand corner looks like the earlier Blue Marvin model to me due to the lack of 'multiple' jacks next to the left speaker grille. The small photo makes it difficult to see, but I'm pretty sure they are not there. Putting these facts about the images together leads me to believe it was probably printed in 1971. 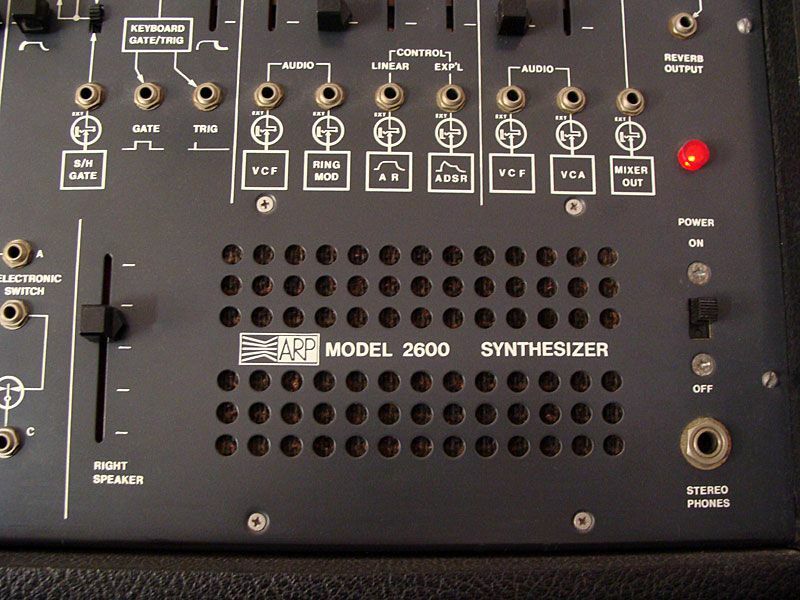 Of course, you can draw your own conclusions - retrosynth.com has an ARP 2600 page with a lot of great photos of the different models and revisions... definitely check 'em out. Funny, the person who left the first comment here leaves comments on my blog as well. More than coincidence? Anyway, I was going through some old stuff tonight and came upon this. It may explain why the ref sheet is so full of text, as this contains the exact same text, but on a large poster. Same blue paper. It's dated 7/71. BTW, if you ever feature the double-page Emulator II Keyboard ad from the summer of 1985, be sure to get in touch. Oh boy do I have a story about that one.